Richard: Today, myself and fellow Kotaku author Toshi Nakamura are here to look at the recently released movie sequel to the 2011 Steins;Gate anime: Steins;Gate: The Burden of Déjà Vu. Toshi: Which was in turn based on a very successful visual novel. Richard: I very much enjoyed the anime series, saying it “might be the best anime I have ever seen.” How'd you feel about it, Toshi? Toshi: Well, while it's not my number one of all time, it's easily in my top 5. Richard: Well, before we get into it, it’s been a while, hasn't it? Last time we looked at a movie together it was Evangelion 3.0: You Can (Not) Redo, was it not? Toshi: Well, to be fair, we didn’t see Steins;Gate: The Burden of Déjà Vu “together.” I was on a date. We just watched the same movie. Richard: True, true, I saw it with about two hundred Japanese men between the ages of 18 and 25—it was kind of a sausage fest. So anyway, I say this time around we talk about the basic premise and then mention what we can without getting into the spoilers—i.e., keep it to less than the amount of spoilers you'd get from watching the trailer. After that, we'll throw up a big bold spoiler tag and get into the nitty-gritty plot details. Sound good? Toshi: Well, we should preface this review with the fact that anyone seeing this movie should probably—scratch that— definitely see the Steins;Gate TV series first, since the plot of the movie relies heavily on the events from the original story. Richard: As you mentioned, The Burden of Déjà Vu is the logical follow-up story to the series. It deals with the fallout from the main story—the incidental side-effects from Okabe's massive amount of time travel. Toshi: Arguably, the series is the best time travel story ever. It was, interestingly enough, based on Back to the Future Part II. Richard: Thematically, The Burden of Déjà Vu is a mirror reflection of the anime series' narrative. Basically in the original anime, Okabe was the hero and Kurisu the princess who needed to be rescued. But in The Burden of Déjà Vu, the roles are reversed and Kurisu has to fight to save him—fight for her happy ending. It's pretty much the perfect framework for a movie like this. Toshi: And quite poetic in that while the original story was about how events of the series affected Okabe himself. In the movie, we get to see how they affected and continue to affect people who share his secret—namely Kurisu. Richard: Agreed. Where the film starts to be hit or miss for me, however, is the difference between Okabe and Kurisu as the main protagonist. For Okabe in the series, the conflict was largely physical: a bad thing happens and he time travels over and over trying to fix it. Kurisu's conflict, on the other hand, is largely an internal one and creates a story that's more about angst than action. Thus there is a fair amount of Kurisu just sitting around doing nothing but thinking in this movie. Toshi: Well, to be fair, Steins;Gate is a more cerebral series with a lot packed into it in terms of food for thought. Plus, the movie is only an hour and 30 minutes long compared to the 24-plus episode TV series. Richard: Indeed. To be clear though, when I say “action,” I don’t mean guns and explosions, I mean having an active role in the story. Toshi: Agreed. But while that is the case, I didn’t necessarily feel that it was a detriment to this story. Richard: The only other minor issue I had with the movie (I'll save the more major ones for the spoiler section) was that it really didn't seem to do much with the supporting cast. The movie would have been nearly identical if everyone sans the big three—Okabe, Kurisu, and Mayuri—were completely absent from the film. Don't get me wrong, I loved seeing all the supporting characters again and I felt they were all acting in character; I just wish that they had been less cameo roles and more vital to the final resolution of the plot. Toshi: I respectfully disagree. I felt the supporting cast had a fairly vital role in the story. My issue would be that their arc was never satisfyingly concluded in the movie. I can’t say much more about that without going heavily into spoiler territory—which we’ll cover later. Richard: Alright then, let's move on to the good and bad of the plot in detail. Toshi: I guess “later” is now, then. Richard: Indeed. The “later” has become the “now.” Spoilers incoming! Toshi: The Burden of Déjà Vu takes place one year after the events of the TV series. Kurisu Makise has returned to Japan after a year’s absence. Rintaro Okabe, having successfully saved both Mayuri Shiina and Kurisu from certain death by creating the Steins; Gate world line, is still haunted by memories of what happened in the Alpha world line and what could have been. The strain of the memories of the other world lines continue to build until they result in Okabe’s deletion from existence, leaving Kurisu with only a vague sense of déjà vu and a drive to somehow find a way to get him back. Richard: Can I just say that I loved the explanation of Okabe's “Reading Steiner” and how having a sense of déjà vu is really just you remembering doing the same thing in another reality? Toshi: Same here. It actually satisfyingly addressed my biggest gripe with the original series in that it never explained why only Okabe had the Reading Steiner. The movie gave me a much more fulfilling answer to that. Richard: I also loved how the movie managed to dodge Kurisu accidentally recreating the Alpha timeline by never sending even a single D-mail. It seems SERN can't track time machines and quantum leaps. Toshi: Because creating the Alpha world line AFTER Okabe’s gone wouldn’t have made things more convoluted than they already were! Richard: More hectic certainly, but also a lot of fun I bet. Anyway, Okabe's reaction to finding out Kurisu had created the time leap machine was awesomely well acted. It was like it nearly tore him apart—and it's no wonder. Okabe has him some crazy PTSD. I mean it's so bad he is getting flashbacks to timelines he never experienced in the anime—aka, he's actually having flashbacks to timelines only seen in the Steins;Gate game. Toshi: Oh yes. Steins;Gate explores the psychological effects of time travel better than any series I’ve ever seen (Sorry, Doctor Who fans). When Okabe is giving his impassioned speech on why Kurisu should leave things the way they are, I could really feel the internal conflict in the characters. Richard: Really, this hits on the strongest part of the movie for me, how insanely emotional the whole thing was. Every scene with Okabe and Kurisu was amazingly well acted. There are key moments where, through the voice acting alone, you can actually hear their hearts breaking. Toshi: I’ll admit, there were several times in the movie I teared up. Toshi: Another argument for seeing the subtitled version (if/when it comes out). Likewise, I’ve rarely seen anyone pull off such an emotional role with voice alone. I’m so glad Imai didn’t decide to retire from voice acting (thank you IdolM@ster). Although, on a side note, I do find it funny that considering the superb acting she does in the movie, she originally didn’t even know there was going to be a movie until she saw the final episode of the TV series. Richard: Glad she stayed on then. The movie wouldn’t have been half of what it was without her. 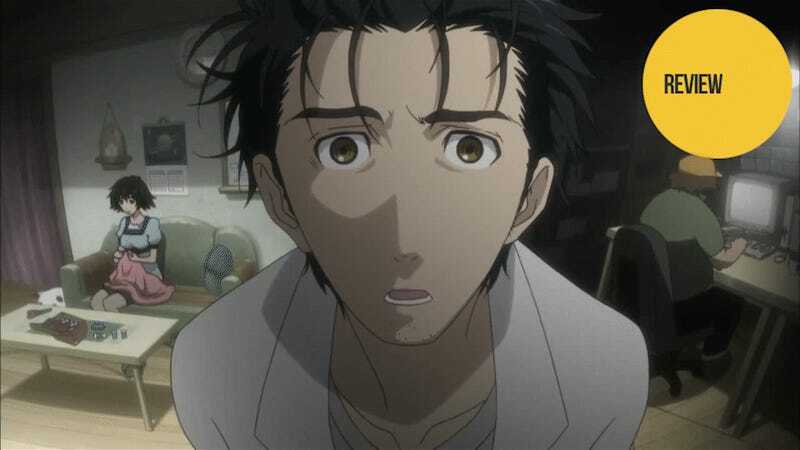 I also loved the amount of development that both Okabe and Kurisu got in this film—from Okabe concluding that being erased from time was well worth creating a world with both Kurisu and Mayuri alive in it to Kurisu finding out that despite trying to move on without him, she will never be able to forget about him. How crazy it must be for her to know that no matter how hard she tries to forget Okabe, bringing him back will become the obsession that defines her life? Toshi: Which is what makes the movie—and the preceding TV series—so good: It’s character-driven as opposed to plot-driven. Deceptively so, considering the story involves time travel. Richard: Now on to the bad aspect of the film—the problem in the film from which all others spawn. The fact of the matter is that The Burden of Déjà Vu is a passive story. Kurisu never acts proactively at any time over the course of the movie. Rather, she simply gives up on saving Okabe over and over until something on the outside affects her enough to try something new. Toshi: I have trouble with this statement. I agree with your point from a logical standpoint, but at the same time, on an emotional level, I disagree. As a reviewer, you’re absolutely right, but as a fan, I want to kill you now. Richard: Even on the emotional side though, this passivity hurts the flow of the story. Instead of us being emotionally involved as she attempts over and over to save him, we watch her give up over and over. The problem is, we know as the audience, that her giving up can't be how the story ends—that something has to change her mind. So we spend most of our time waiting for the next thing to come along and get her to try again. Toshi: Well, that seems more like a technical issue. Since they didn’t have 24 episodes to show her attempts, I think the movie chose to focus on the repercussions of her actions rather than reflect Okabe’s story note for note (which again would have taken too long). And I’m sure you’ll agree, her actions and responses are never out of character. Richard: Indeed, she acts very in character, though I do somewhat question that she would continue to give up so easily—especially after she’s accepted her feelings for Okabe. Nonetheless, it is pretty touching that she respects his wishes about not doing the whole time travel thing even though it hurts her emotionally. But in the end, Toshi, the weirdest thing about the film is that it doesn't even have a climax. It's more like she just stumbles forward so long that eventually the movie ends. Richard: Well, that’s all I have. Anything else that bugged you? Toshi: Well, getting back to my previous comment about the plot point of the side characters: Did you notice that the issue of the rent hike was never concluded in the movie? Richard: Yeah, it’s just like that conflict was thrown in there in order to add a bit of tension into the final act of the film, and once it served that purpose, it was entirely forgotten. Or maybe it’s just that the main plot of the film was resolved before this sub-plot, and thus the movie ended before we could see its resolution. Toshi: Which is why I can’t fault it outright, since the main plot is much more important, and I do like an atmosphere of ambiguity at times where the viewer gets to decide what happens, but at the same time, that was a thread that could have been resolved with just a couple of lines between Kurisu and Okabe at the very end of the movie. Richard: Or a single line from Farris (aka, the girl who owns every building in Akihabara). Richard: So Toshi, what are your final thoughts on Steins;Gate: The Burden of Déjà Vu? Toshi: If you love the TV series, or the original game, you have no excuse not to see this movie when it’s made available. It continues in the vein of the original in making you both think and feel along with the characters. Also, Asami Imai’s portrayal of Kurisu Makise in this movie was outstanding. That alone makes watching the entire TV series worthwhile. That said, the movie is crippled without its origins and this is not a movie anyone should see without watching the TV series or playing the game. How about you? Richard: But I kid. Despite certain similarities, The Burden of Déjà Vu was far more emotional than the Haruhi movie. Like the series, this emotional weight is the key of this movie. This movie really lives or dies on how well you connect to Kurisu and Okabe—and given the amazing performances of their voice actors, I can't imagine not being able to. So despite the issues I had with the lack of tension in the movie, I enjoyed it for the most part. It wasn't as good as it could have been, mind you, but I don't think the existence of this movie made the series worse or anything. Toshi: For me, it was an excellent epilogue to the Steins; Gate story. Like I said before, it addressed my Reading Steiner issue, which earns it extra points. It’s definitely a good movie, but it’s not essential to enjoy the story of Steins; Gate. I already love the story, so it was basically dessert to a magnificent meal. Richard: So what's next for us, Toshi? We've got a new Madoka Magica movie and two new Studio Ghibli films coming out this year. Richard: Welp, it seems we have a lot to look forward to this year. Keep checking back with us at Kotaku East for reviews of all these movies and many more anime series. How was that for a shameless plug? Steins;Gate: The Burden of Déjà Vu was released in Japanese theaters on April 20, 2013. There is currently no word on an international release.